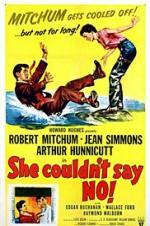 Buy or Rent She Couldn't Say No (1954) Movie DVD & BluRay Online! Movie Plot: As usual with most of the RKO films from this era “presented” by RKO-owner Howard Hughes, the PCA number is usually 500-1000 digits lower than the one from other studios being released at the time, indicating it was released a year or more after it was completed. This one finds heiress Corby Lane (Jean Simmons) coming to a small Arkansas town to play Santa Claus because, when she was a small child traveling with her impoverished father, the townspeople saved her life by donating money needed for medical treatment. She meets and falls in love with “Doc” Sellers (Robert Mitchum), an easy-going doctor who enjoys fishing and the unhurried pace of the town. Corby’s gesture of handing out money and lavish gifts to the citizens backfires when, after it has been publicized, the town becomes the destination of every wayward traveler and fortune seeker.